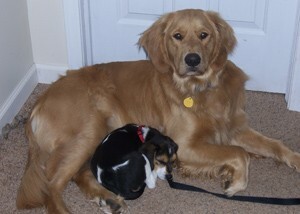 Morgan (Golden Retriever) and Gracie (Beagle). Morgan is 18 Months old and Gracie is 10 Weeks old. We adopted Morgan when he was 11 months old from someone who could no longer keep him. Gracie was my Mother's Day gift from my hubby. Morgan and Gracie are the best of buddies. Morgan took on the Big Brother role with abandon. Gracie uses her sharp little teeth on him, but Morgan is forever gentle with her even when she hurts him. They play constantly and are a great source of entertainment! I sometimes laugh til I have tears in my eyes. I thought having two dogs was going to be difficult. Instead it has been very rewarding. Morgan sets the example and Gracie follows in her big brother's footsteps. In fact, I think housebreaking a puppy has been easier because I already had Morgan. They are such blessings and, after just 3 weeks of having Gracie, I can't imagine life without either one of them. Awe, so sweet. Aren't goldens the best?